This page is about how JMRI connects to external systems, e.g. DCC systems. There's a lot of variation within JMRI on this, so you'll have to go through any specific implementation. Specifically, older systems weren't always arranged this way, so existing code may not be a good example. See also the Multiple Connection Update page. The code for a general type, like "LocoNet connections" or "NCE connections", should be gathered in a specific package right under jmri.jmrix e.g. jmri.jmrix.loconet and jmri.jmrix.nce. In the preferences dialog and JmrixConfigPane main configuration code, this level is called the "manufacturer selection". It provides a level of grouping, which we may someday want to use for e.g. providing separate updates for specific hardware, while still separating the system-specific code from the system-independent parts of JMRI. In the preferences, this is called the "connection mode" selection. Additional subpackages can be used grouping various functions as needed. For example, Swing-based tools should go in their own swing subpackage or at a further level within the swing subpackage. The key to normal operation (after start up and before shut down) is a SystemConnectionMemo object that provides all necessary access to the system connection's objects. For example, the LocoNetSystemConnectionMemo provides access to a number of LocoNet-specific objects and LocoNet-specific implementations of common objects. Although some of those (e.g. a SensorManager) might be separately available from the InstanceManager, accessing them from a SystemConnectionMemo allows you to find the consistent set associated with one specific connection of a multiple-connection setup, even when there are multiple connections of a specific type. There are also a few tools that work with the SystemConnectionManager objects themselves after obtaining them from the InstanceManager. We don't directly persist the SystemConnectionMemo. This is partly for historical reasons, but it also reflects the level of abstraction: A SystemConnectionMemo is at the level of a "LocoNet connection" or a "NCE connection", and there's a lot of specific information below it to configure one of many possible such connections. Instead, configuration of the connection is from the bottom up: From the most specific code up to the general. The "Adapter" object connects directly to the system, e.g. managing a serial link, and then builds up the objects that work with that link, including all the various type managers. This makes sense because the type of the connection is really specified via the type of that link and what's on the other end of it. This section describes the LocoNet implementation of the new (post-multiple) configuration system. This is similar for LocoBuffer, LocoBuffer-USB, PR3, etc connections, but we use the specific LocoBuffer-USB case for concreteness. This sequence picks up after the basic startup of the application itself, see the App Structure page for that. 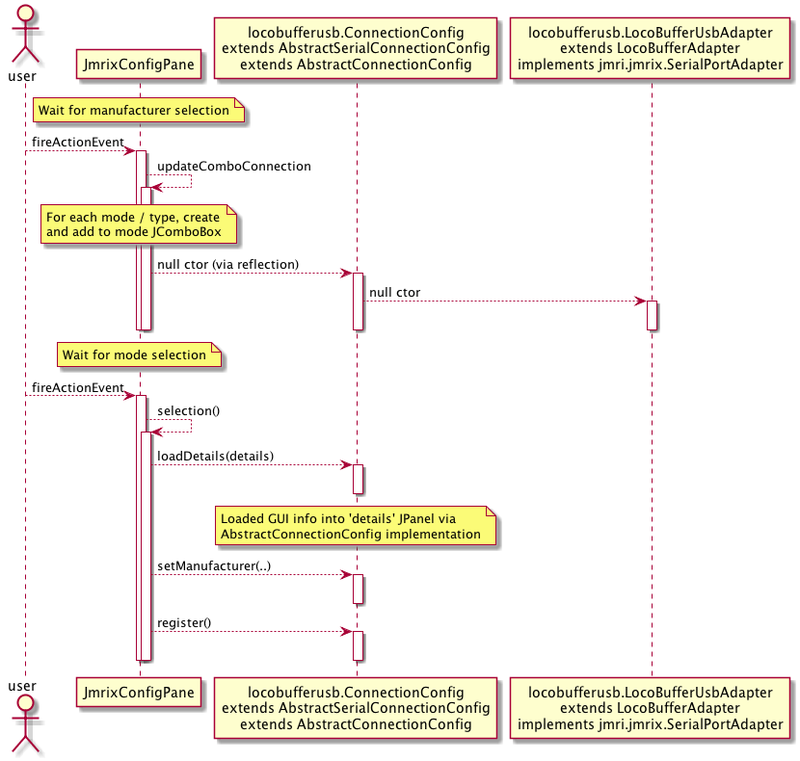 A ConnectionConfigXml object, created by the ConfigureXML system as part of reading the preferences. It drives the process. An Adapter object of a very specific type, which handles both the connection to the system hardware, and (through its configure() method) the creation of the rest of the system. An object of type jmri.jmrix.loconet.locobufferusb.configurexml.ConnectionConfigXml is constructed by the configurexml mechanism when the specific class is named by the file during the initial preference load at application startup. 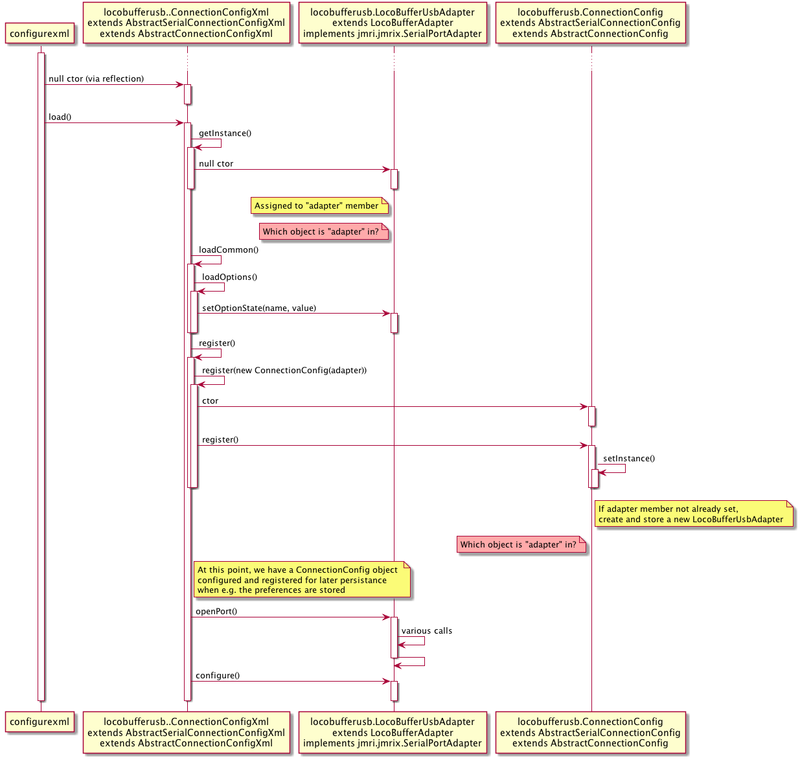 The ConnectionConfigXml object is a child of the jmri.jmrix.configurexml.AbstractSerialConnectionConfigXml class, which is in turn a child of the jmri.jmrix.configurexml.AbstractConnectionConfigXml class. Invoke getInstance() which initializes an adapter member implementing SerialPortAdapter. In this case, getInstance() is implemented in jmri.jmrix.loconet.locobufferusb.configurexml.ConnectionConfigXml and assigns a jmri.jmrix.loconet.locobufferusb.LocoBufferUsbAdapter to the "adapter" member of "ConnectionConfigXml" That's used later on to configure the port, etc. Calls loadOptions(perNode.getChild("options"), perNode.getChild("options"), adapter) to do any additional handling of info coded in an <options> element. Although overridden in some cases, the default for this is to invoke adapter.setOptionState(name, value) In this LocoNet case, that stores the command station name, see the element above. That this.setInstance() call is implemented in jmri.jmrix.loconet.locobufferusb.ConnectionConfig to set the "adapter" member there to a new LocoBufferUsbAdapter object. Note that this "adapter" is from the ConnectionConfig (specifically AbstractConnectionConfig) object, not the ConnectionConfigXml object referred to above. In the sequence we're showing here, the LocoBufferUsbAdapter object had already been created by getInstance in ConnectionConfigXml, and passed to the ConnectionConfig object when it's created inside the register() sequence. At this point, we have a jmri.jmrix.loconet.locobufferusb.ConnectionConfig object registered for persistence, so it can be written out later. Initialize the actual port using adapter.openPort(portName, "JMRI"). This uses code specific to the adapter member that was initialized in getInstance(), i.e. in thise case LocoBuffer-USB code. The second group loads the previously-created SystemConnectionMeno with information about the connection. At this point, the system is basically up and ready for operation. Finally, a jmri.jmrix.loconet.LocoNetSystemConnectionMemo object is created and registered with the InstanceManager. For each of those, ask it for the menu object (e.g. LocoNetMenu) and post that to the GUI. In the process of creating the menu, the ComponentFactory connects each Action to itself so that the individual tools will be able to connect to the proper e.g. TrafficController, SlotMonitor, etc. When an Action is fired later on, the invoked class(es) enquire of the LocoNetSystemConnectionMemo when they need a resource, instead of referring to an instance() method in the resource's class. Should this part move up? It's important that managers only be created once. More specifically, the managers and the SystemConnectionMemo should only be registered in the InstanceManager once. If they're registered more times than that, they appear as duplicates in various auto-constructed lists, menus and tab sets. Much work is done in the PortAdapter subclasses. From a common jmrix.PortAdapter interface, JMRI has two different forms for those: jmrix.SerialPortAdapter (Serial/USB connections) and jmrix.NetworkPortAdapter (network connections). Abstract base classes implement those as jmrix.AbstractSerialPortController (Serial/USB connections) and jmrix.AbstractNetworkPortController (network connections) (most, but not all, systems use one of those) with a common base of jmrix.AbstractPortController. 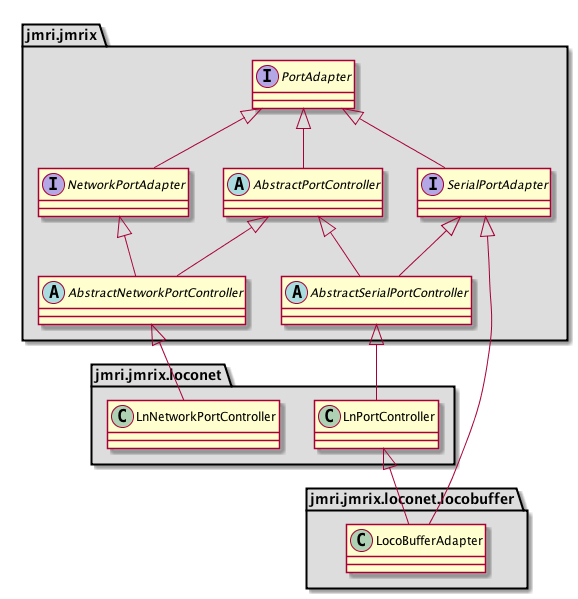 These in turn are inherited into the system-specific classes, e.g loconet.LnPortController and loconet.LnNetworkPortController respectively (see UML diagrams on those linked Javadoc pages). Because Java doesn't allow multiple inheritance, the system-specific descendants of the two abstract base classes can't actually share a single common system-specific base class. This results in some code duplication in e.g. serial/USB connections vs the network connection classes in the system-specific classes. as you work down the abstraction. This should eventually be fixed. disabled="no" port="(none selected)" speed="9,600 baud"
How this gets read in. Any particular system connection is included in the preferences by being listed in the java/src/META-INF/services/jmri.jmrix.ConnectionTypeList list. This file is normally generated from the @ServiceProvider(service = ConnectionTypeList) class-level annotations. This provides the contents for the 1st-level selection in the top JComboBox, e.g. in this case "Digitrax". This (generally) corresponds to selecting a system package within the JMRI package that might contain multiple varients of a specific connection. Within JmrixConfigPane this is called the "manufacturer" selection. The contents of the jmri.jmrix.loconet.LnConnectionTypeList, an instance of jmri.jmrix .ConnectionTypeList then provides the contents for the second-level JComboBox of specific connection types, each corresponding (generally) to a specific ConnectionConfig implementation that can configure a specific connection type. Within JmrixConfigPane this is called the "mode" selection. Note this starts off by creating a ConnectionConfig, which creates a PortAdapter, similar to the read-from-XML version. But we don't want a running connection: We want one that we can work with to set/store configuration information. So, although we "register()", we do not "configure()". AbstractSerialConnectionConfig handles connections through serial links that need specification of serial port name, baud rate, etc. AbstractNetworkConnectionConfig handles connections through network (TCP) connections that need specification of network address, port, etc. AbstractStreamConnectionConfig handles configuration of connections based on streams. AbstractSimulatorConnectionConfig handles configuration of simulated connections. The Swing panel that shows the main options (e.g. option1 through option4) sets changes to those values directly into the ConnectionConfig/PortAdapter without asking them to act further via e.g. configure(). Changing the mode JComboBox in JmrixConfigPane first clears the existing contents of the details JPanel with removeAll(), then calls the JmrixConfigPane.selection() method to refill it. This section is a grab-bag of other things you might want to know about the system connection structure. The jmri.swing.ConnectionLabel class is a Swing JLabel that listens to a single connection and displays its status. We use those on the main splash screen, but they can also be used in other places.